As a parent I am always worried about what products in my house may have been recalled. I always have a hard time finding information about recalls though. I can't even tell you how many times I have decided to look online at products that have been recalled and found some that I had in my house and were using. Most of them were products I used with my children and had been recalled weeks before I looked. That would always frustrate me. She Speaks has introduced me to a solution to this problem though. The new app Recalls Plus is amazing! Recalls Plus helps me and any parent stay ahead of the game when it comes to our children's safety. 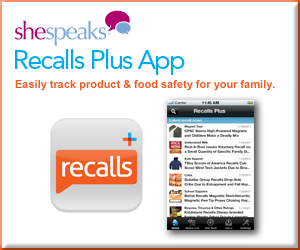 Recalls Plus helps you keep track of children's products as well as food allergen recalls. The best part is that you can make your own watch list. I loved that I could put so many children's products on my watch list. On my watch list I put highchairs, bicycles, bottles and accessories, car seats and strollers. The new Recalls Plus app is available on Facebook, IPhone, and Android. Recalls Plus was created by SAP—a market leader in enterprise application software, who’s vision is to help the world run better. You can find Recalls Plus on Facebook, at the App store and on Google Play. Thank You She Speaks and Recalls Plus for introducing me to this new app.